I’m still studying! 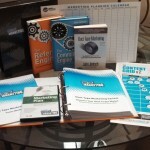 Here are all the materials I received for the Duct Tape Marketing Catalyst program. Included are several booklets for each segment of the program. 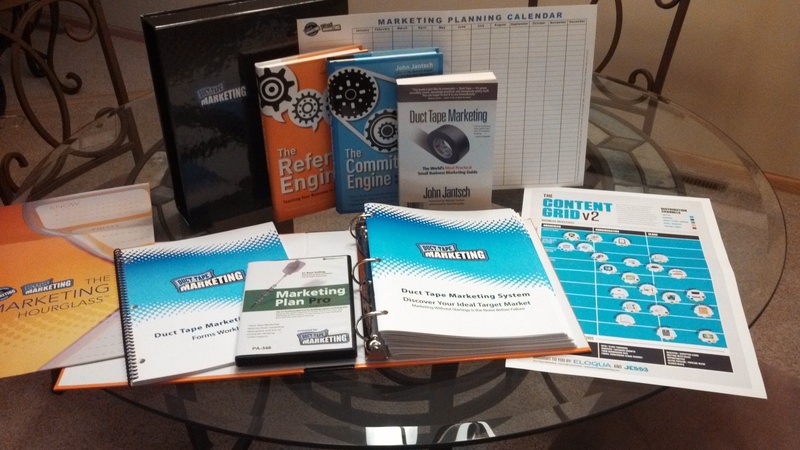 All three of John Jantsch’s books are also included, the Marketing Plan Pro software, forms book, full size Marketing Hourglass, Content Management Grid, and full-size Marketing Calendar. Whew! When you sign up for the program you have the option to receive all the hard copies like those pictured here. Most people actually opt for the online portal, since everything is stored online for easy access. Looking forward to traveling to Kansas City in a couple weeks for 3 1/2 days of Intensive Training.